HEADLINE – Exciting times ahead for the future of Hospice care on the Isle of Anglesey. Plans for the first ever Hospice on Anglesey have been announced. St David’s Hospice is working to open the first ever inpatient hospice on the Island at Holyhead’s Penrhos Stanley Community Hospital. The ambitious plans, which have been developed in partnership with Betsi Cadwaladr University Health Board, will see the development of satellite hospice unit at Penrhos Stanley, which will aim to deliver the same five star service currently available at the main hospice in Llandudno. The plans include the conversion of part of a ward which is no longer being utilised by the hospital, converted into four single-bedroom units for inpatient hospice care. The project is currently in the design stage and architectural drawings will be released soon. The service will offer a combination of end of life care, symptom control and respite care. Staff at the satellite unit will be trained to the same high standards and expertise in specialist palliative care provided at the main Hospice in Llandudno. The new service will work closely with and complement the existing Hospice at Home service on Anglesey. St David’s will fund and train all staff at the unit, the Health Board will be providing the space at the hospital and contributing towards the running costs of the building. It is hoped that the internal building work will commence this summer and opened early 2019, with approximately 15 new jobs created for local people. St David’s Hospice will also be employing local fundraising staff and a team of volunteers to help support, fund and run the new unit. More details will be available soon. 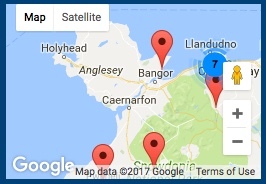 At present, the only inpatient hospice beds in North West Wales are located at St David’s main hospice in Llandudno. For some patients, this means a 90 minute journey for inpatient hospice care. It is hoped that with the new units St David’s Hospice will offer choice and end the postcode lottery that currently exists. 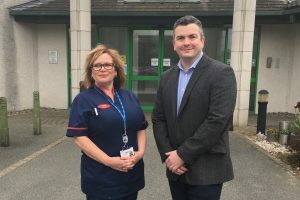 This development comes after two local charities, St David’s Hospice and Hospice at Home Gwynedd and Anglesey recently merged to form one charity that will deliver hospice care across Conwy, Gwynedd and Anglesey. St David’s Hospice is a registered charity and over 80% of the income is generated through local community fundraising. It is anticipated the project will cost in the region of £500,000 to establish the unit then annual running costs thereafter. Betsi Cadwaladr University Health Board and Isle of Anglesey County Council will be providing short-term funding of 30% for the first year towards nursing salary costs and 15% in the second via the Intermediate Care Fund. “We are delighted to be working in partnership with St David’s Hospice and Anglesey Council on this exciting development. “Our key aim is to deliver care closer to home and ensuring equity of access to services across the population of North Wales.